When Jason Bourne is framed for a botched CIA operation he is forced to take up his former life as a trained assassin to survive. 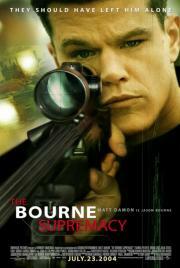 Another solid entry in the Bourne series. Although the plot is a little too similar to the original it still manages to be pretty tense and be just different enough to not be obnoxious. Although this still relies on shaky-cam here it seems more tolerable, probably because everything else is frantically edited as well.